Elegant and classy, these sets of 2 "Debbie" Candle Holders add sophistication along with warm, glowing candlelight as centerpieces or cake and gift table accent pieces! Each holder is 7 1/2" tall by 4 inches wide and the metal scroll work has crystal clear acrylic beads dangling down. The beads are faceted to catch the tiniest bit of light and each holder comes with a clear glass candle cup measuring 2 3/4" tall by 2 1/4" wide, making this set of candle stands wedding and event ready! Float mini foam roses or simply add real wax or flameless candles and use in groups or place individually throughout your venue. 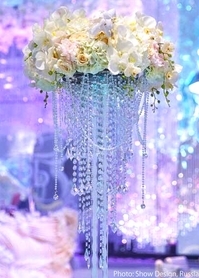 The glass cups are quite substantial and if you'd like to add color to your holders, simply add Water Pearls or use colorful submersible LED lights with clear water pearls. 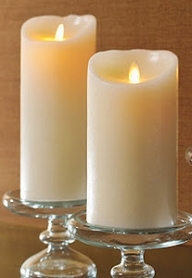 Another idea is to set these on Centerpiece Mirrors to enhance the reflection. 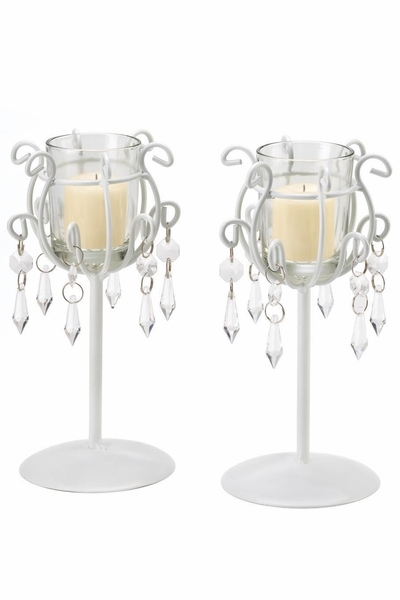 If you're in need of a larger centerpiece or grand focal point, this set of 2 holders match many of our white candle chandeliers, candelabras, floor standing candle holders and tall centerpiece vases.